SEOUL, KOREA – Media OutReach – November 16, 2018 – Global technology solutions provider Arrow Electronics, Inc., has been awarded “Great Place to Work for 2018 in Korea” by the Great Place to Work® Institute in an awards ceremony held today in Seoul, for the company’s outstanding employer practices. The award is judged by Great Place to Work® Institute, an international trust management evaluation agency, based on a diagnostic program “Trust Index©” that measures companies across five main categories: “Credibility, Respect, Fairness, Pride, Camaraderie.” It is followed by a Culture Audit conducted by Great Place to Work® Institute KOREA, a global culture consulting company. The “Trust Index©” Survey has been recognized as a global standard tool for measuring and analyzing the level of trust and satisfaction of employees. The measurement has been adopted across 60 countries, including the United States, European Union and Japan. 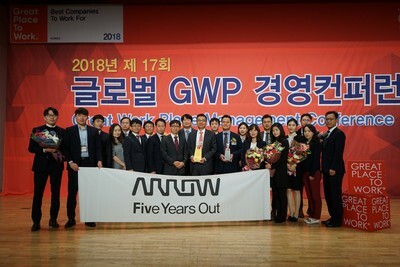 This year’s results revealed that Arrow Electronics in Korea outscored in overall performance in all five of the diagnostic categories, compared with its industry counterparts. Arrow Electronics has won multiple HR awards recently, including HR Asia’s “Best Companies to Work for 2018TM” in China in October, and was also crowned with the same title in Hong Kong and Malaysia earlier this year and Singapore and Malaysia in 2017. Arrow Electronics guides innovation forward for over 150,000 of the world’s leading manufacturers of technology used in homes, business and daily life. With 2017 sales of $26.6 billion, Arrow aggregates electronics and enterprise computing solutions for customers and suppliers in industrial and commercial markets. The company maintains a network of more than 345 locations serving over 80 countries. For more information visit www.arrow.com.